Spirit levels are used to check if a surface is horizontal (Level) or vertical (plumb) by using bubble vials, most levels have both horizontal and vertical vials, although some levels also have an adjustable vial for angled use. Measuring with a spirit level is one of the oldest and one of the most accurate, building procedures for determining horizontal and vertical lines. Levels are easy to use by professional tradesmen and DIY enthusiasts alike. End caps: End caps, found at each end of a level act to protect the measuring surface. Many are shock-absorbent, such as on the Stabila 96-2 Series to ensure effective energy absorption upon impact. Other levels, such as the Stabila Masons Level have removable end caps, which allow the level to mark right into corners and lay on narrow edges. Measuring surfaces: The measuring surfaces on spirit levels can be designed in various ways. In most cases, the complete body of the spirit level, including the measuring surface, is powder coated, painted or anodised . However, on some levels, such as the Stabila 196-2 Double Plumb level, the measuring surface is also milled flat. In addition, levels, such as the Stabila 81 SV Magnetic Torpedo Levels also have a V-shaped groove, which allows it to fit over and measure pipes. Some levels, like the Stabila 96-M-2 Level also have a strong magnet on the measuring surface, which is ideal for steel construction work. 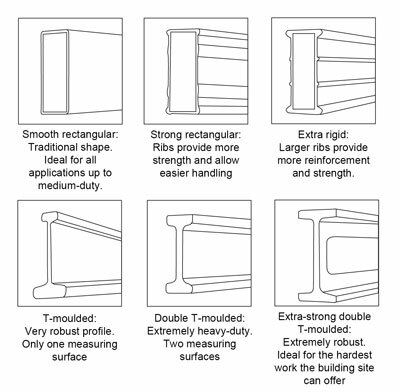 Girder Levels (also known as I beam) are more robust and are more suited to heavy-duty use. Electronic (or digital) Levels combine a spirit level with vials, along with a digital screen to measure and display angles. These levels allow setting of a ‘false zero’ to allow marking out falls, such as in plumbing applications. They are also ideal for repetitive tasks. Line, Pocket & Post Levels - A pocket level is the most simple type of level. It consists of just one vial, and is compact in size for easy storage and transportation. A line level is similar in size to a pocket level, but is fitted with a hook at either end to attach to a taught cord to ensure that a levelling line is truly horizontal. Post levels are ideal to ensure fence posts are upright prior to fixing. Other uses include plumbing pipes, levelling of RSJs and other applications where both a vertical and horizontal is needed. Torpedo, Scaffold & Boat levels are much smaller levels than box section or girder levels making these ideal for light DIY use but especially suitable for scaffolders, pipe fitters and steel erectors where the traditional longer levels are more difficult to work with. Many have bevelled shape which makes then suitable for working in cramped spaces. Water Levels such as the Faithfull 10M Water Level utilise the principle that water will always find its own level. They are very accurate instruments which are used widely throughout the construction and building industries. A water level is the ideal tool for accurate unsighted room to room measurement or distant levelling, when using a spirit level would be ineffective. Angle Levels such as Box Spirit Levels are a versatile measuring instrument, which combine the functions of both a spirit level and protractor. The levels allow precise measurement and marking out of angles.